Welcome if you’re visiting for the first time via Bloggers Quilt Festival. 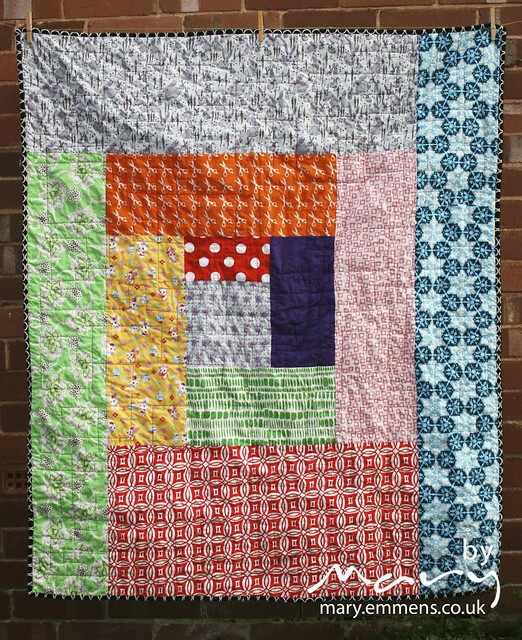 Over the last few days I’ve been admiring the hundreds of quilts (471 as I write this) that have been linked up. 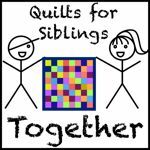 I have a few quilts that I could link up, but I made them earlier this year for Siblings Together and so they have new homes now and have sort of fallen off my radar. 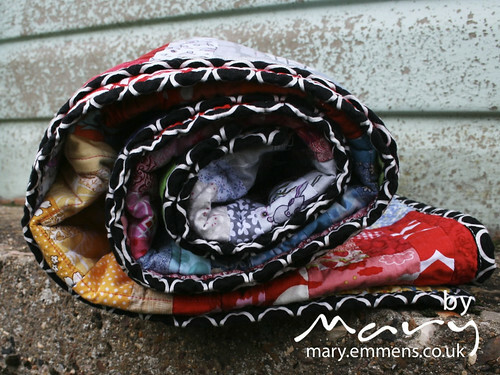 But I have been working on a couple of scrappy quilts this last month. As you might expect from a scrap quilt they conjure up memories, a number of the fabrics can be found in other quilts in our house, some of the yellows have been hanging around for 10 years or more! Not a colour I use a lot of but I did use it in one of the first quilts I made. The yellow on white print is a fabric that an old lady passed to my mum over 20 years ago! How life has changed since then, from trawling around fabric shops which then (and now) were far between we now have the wonders of the internet and the ability to order fabric from anywhere in the world. So my fabric collection has grown and so has my scrap box. I’ve had scraps contributions from a number of friends over the years which have been delightful to rummage through and put to use. A whole load of scrap busting has gone on and this morning I finished the binding and into the washing machine went a finished quilt. I quilted this myself on my new Janome Horizon, I bought it last month so this is the first item to be quilted on it and what a dream to have such a large throat space. I was debating how to quilt this and saw the back of Sarah’s entry to the festival and sat down and sketched out a square design which I didn’t stick to as I quilted but it was a good starting point! I bound it using Metro Circles in black and I like it! Machine piecing was done with Aurifil 2021 and quilted using 2530 from the Pat Bravo box of threads that I won from Alex Veronelli! Thanks for visiting and thanks to Amy for another amazing festival. I’m a big fan of scrap quilts and log cabins so this ticks off the boxes for sure! Lovely and bright. It’s fantastic – I love the big log cabin back too. That is lovely. What a busy lady you are! 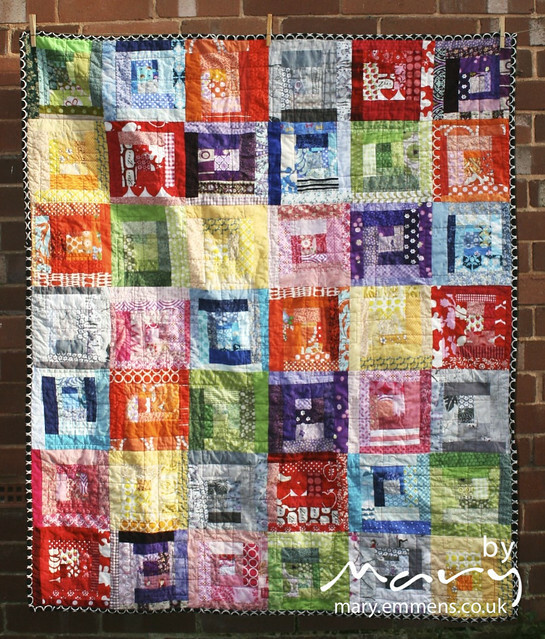 Looking forward to seeing your other scrappy quilt as well! Very pretty! Great way to use up scraps. I love that black binding! Wow, skin of the teeth indeed! I love your brights on this, and the story. My how fabric shopping has changed, but it is still nice to use up the scraps too. Way to go, scrappy squares! I particularly like your scrapp ed llog cabin backing, very nice! 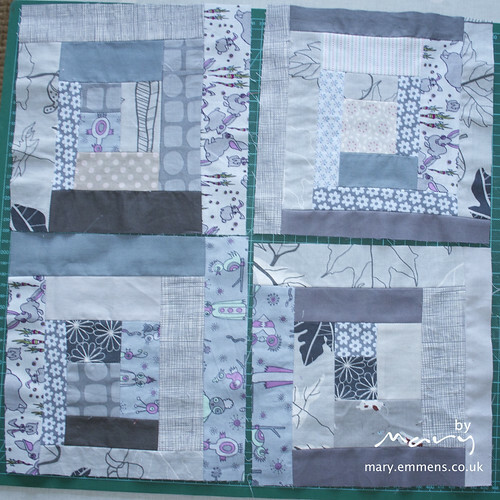 Wow Mary, that is absolutely gorgeous and by far my favourite scrappy one of these style quilts. What a great entry to the Festival. Perfect binding and backing too. Your new machine sounds blissful. Lovely! The back is so fun. 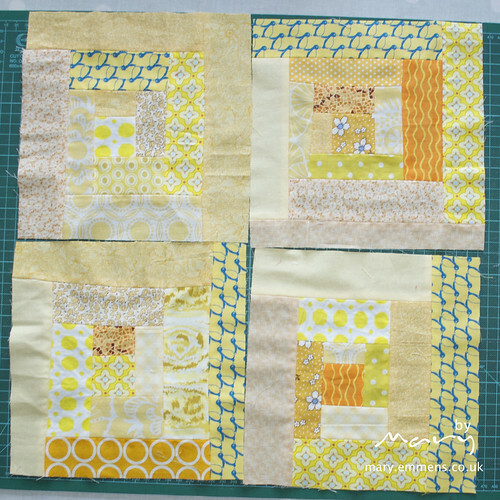 The grey blocks might be my favourite, but I love the overall bright scrappiness of the quilt.